The BSM-ROR cage welding machine for manufacturing reinforcement cages for the manhole and concrete pipe industry, the machine that has made the innovative ROR (round/oval/round reinforcement) a reality, is now also available with various additional benefits such as an automated longitudinal wire feed (ALZ) from a coil as well as a bundle and an automated cage removal robot (KEG) and consequently meets the requirements for a fully automated functioning. 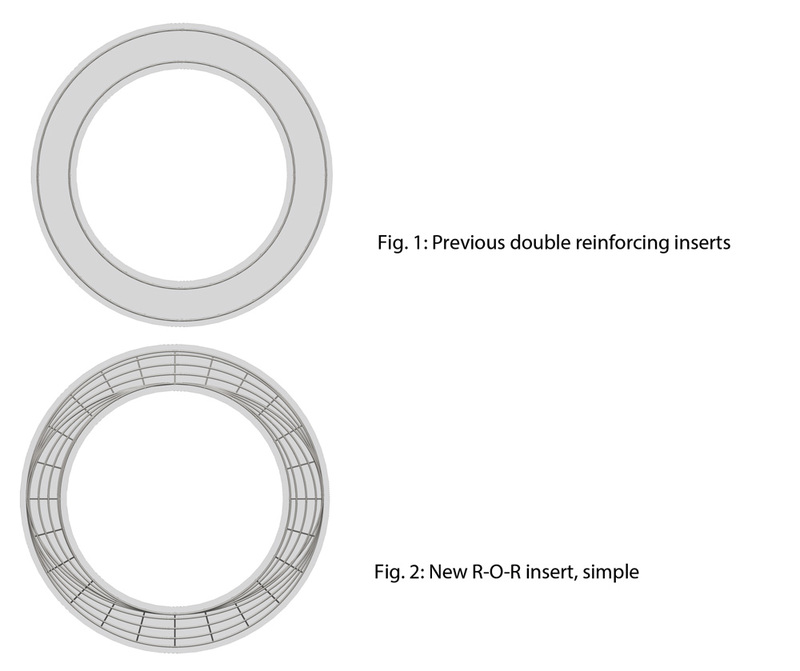 Using this innovative manufacturing method for the ROR reinforcement, a high mechanical strength is achieved through optimising the ROR reinforcement geometry. This means that an enormous savings potential can be achieved since up to 50% of the reinforcement material per concrete pipe can be saved. With the ROR reinforcement, both tensile zone areas of the interior and exterior reinforcement are covered; consequently, only one reinforcement per concrete pipe is required instead of two. With this development, one cage could be made in certain dimensions without having to accept compromises in the required stability (structural analysis) of the end product. 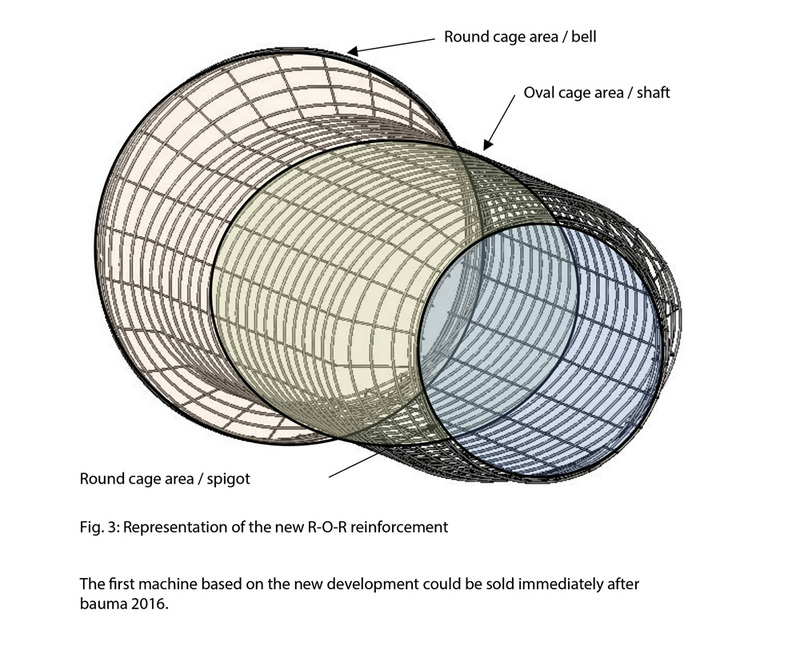 Further savings potential through using reinforcement cages with the modified ROR (round/oval/round) geometrical shapes is the time of producing one ROR cage instead of two round cages (exterior and interior cage), no fitting together of the exterior and interior cages and no welding of distance spaces between the exterior and interior cage. The result is a significant reduction of production time and handling expense of the cages. This proven BSM-ROR machine has been still further developed and outfitted with interesting additional features. An automated longitudinal wire feed (ALZ) with longitudinal wires from a bundle now supplements the standard version of the BSM-ROR. The longitudinal wires are automatically separated from the bundle and fed to the welding machine. Another additional benefit is in the automated cage removal robot (KEG), which permits several depositing and placement positions. This means that the reinforcement cage can be deposited in a device or elsewhere. In this phase of further development, the fully automated functioning of the BSM has been achieved, which makes it extremely suitable for a stable and economic day-to-day production. It is also the result of the company philosophy of the global market leader mbk-Maschinenbau GmbH. This philosophy indicates establishing on the market only high quality products and developments whose robust construction guarantees maximum stability and longevity, which are low maintenance, facilitate efficient and flexible working and are technically state-of-the-art. The option must also be provided to the customer to execute at any time the configuration/expansion of the machine through optional additional equipment corresponding to the customer’s individual requirements. In this way, an enormously high degree of customisation is achieved. This ensures flexibility and investment in a fast-changing market! mbk-Maschinenbau GmbH is constantly meeting the new challenges of its customers. Ideas are further developed jointly with the development team and brought to series production through the synergies of the worldwide networking of customers, partners and subsidiaries. It is a matter of always doing our best in order to ensure our own progress and that of the customer and to be one critical step ahead. mbk-Maschinenbau GmbH is grateful for this!